All new footage has been posted to youtube of the 9/11 Truth graffiti. Some really daring work which resulted in the local news showing the collapse of WTC7. 9/11 TRUTH graffiti - Building Seven? This video is posted for educational purposes only, and is not meant to encourage this type of activity. 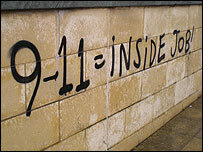 A spate of graffiti about the September 2001 attacks in America has appeared around Bristol. The spray-painted words '9-11 = iNSiDE JOB!' have been spotted across the north of the city. Fly-posters and stickers making the same claim predated the spray-painting in the same area. Neither the police nor the city council has received complaints about the graffiti, although a police spokesman said graffiti was criminal damage. A spokeswoman for the council said they would look into it. BENTONVILLE -- Political messages about "9/11" were spray-painted on two of Benton County's trucks Monday, a day after Bentonville police began investigating graffiti on the main county courthouse and annex. Vandals used silver metallic spray paint to send the message, "9-11 Was An Inside Job," on a Chevy Colorado and a Dodge Durango belonging to the Benton County Assessor's Office. "I don't know if there is any significance to the color they picked," said Bentonville Police Chief James Allen. Police also couldn't determine a meaning from the date the vandalism occurred, which was likely Friday night or early Saturday morning. Allen said there are no suspects and no "useable video camera recording." Graffiti on the front exterior wall of the courthouse at the top of the steps facing the square read "9/11 = Inside Job," also in silver metallic letters. Other versions of the message were found on interior side of the four marble pillars.